Eeek! 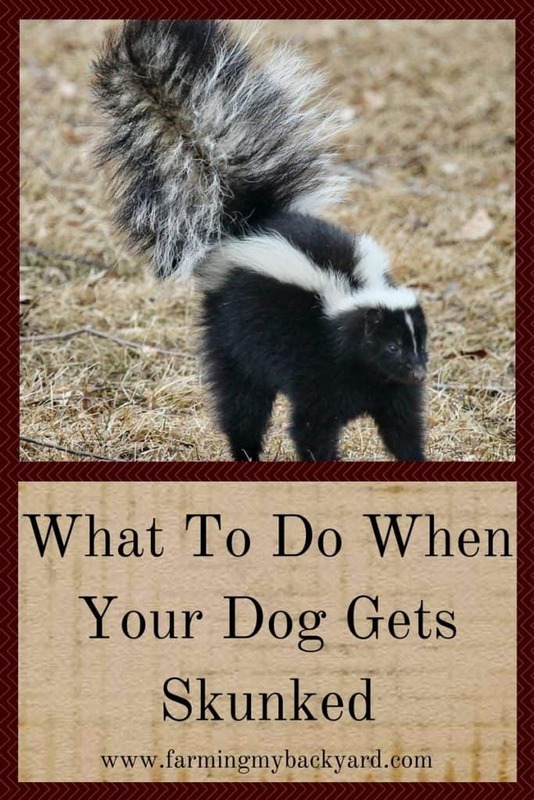 Your dog went out to use the grass and instead your dog gets skunked! He smells horrible and his eyes probably hurt. What are you supposed to do? First things first DO NOT LET HIM IN THE HOUSE. You probably weren’t going to anyway, but, just in case you thought about it in your momentary panic. Second, this is a toss up, you can A: Run inside and change your clothes into something that you can stinkify or B: Rinse any skunkiness out of your poor doggies eyes. Make sure to do both though! Third, don’t waste your time on tomato juice. Maybe your dog is special, but mine just smelled like skunked tomatoes. Related Posts: Can You Have a Dog AND Chickens and Predator Proof Chicken Coops: A Simple Way To Protect Your Flock. What Works When Your Dog Gets Skunked? What DOES help once the dog gets skunked is this nice little recipe we found on the Humane Society. When our dog got skunked we mixed up a batch of it and applied it liberally (like three times). Mix together a quart of hydrogen peroxide, 1/4 cup baking soda, and one teaspoon dish soap. Don’t get it in his eyes, and you’ll want to wear gloves. Apply and rinse, apply and rinse, apply and rinse, until you think maybe he’s starting to smell less. Before you let your doggie back in the house wash again with his regular shampoo. When our dog, Lawrence valiantly defended our chicken coop from sneaky egg-eating skunks (hahaha, yeah right), he still had a lingering skunky-ness to him after doing this, but he slept in the house that night without reeking or spreading the smell. Poor dude. I agree, tomatoes don’t smell any better! The solution works best if you let it sit on the dog for about 5 minutes before you rinse it off.